I did a bit of grocery shopping on Wednesday and then asked him what he would like for his birthday dinner. In a bit of hilarity, he named exactly the dinner I had planned for Wednesday night. So I made eggs and sausage for Wednesday instead, because breakfast is always yummy. Fiesta Mart here in Dallas has great deals on certain cuts of meat, fajita being one of the best. We both adore beef, so this is a staple. We also love chimichuri. And these potatoes I make. And asparagus. These aren’t necessarily recipes as much as they are methods. 1 flank steak, Adobo seasoning, Montreal Steak seasoning, apple cider vinegar, oil. The vinegar and oil are measured by the some. You need some but not tons. The Adobo is about a tablespoon, same with the Montreal. You have to figure out how much you like. Anyway, throw it all in a bag and let it ruminate on it’s demise on the grill for about an hour. In or out of the fridge, doesn’t matter. Heat up your grill to the highest setting and then slap that puppy on there. Turn it every two minutes until it’s done like you like it. Don’t cook it until it’s stiff – it’s over done when it’s stiff. Use a thermometer if you need to, but we do that thing where you feel the give in the meat to check for doneness. Take it off the grill when it’s like you like it, let it rest for 10 minutes. Cut it across the grain and then eat it. YUM! 1 bunch of Asparagus, washed and dressed with a bit of oil. Don’t season it, you’ll see. Grill this next to the above steak. It won’t take long. 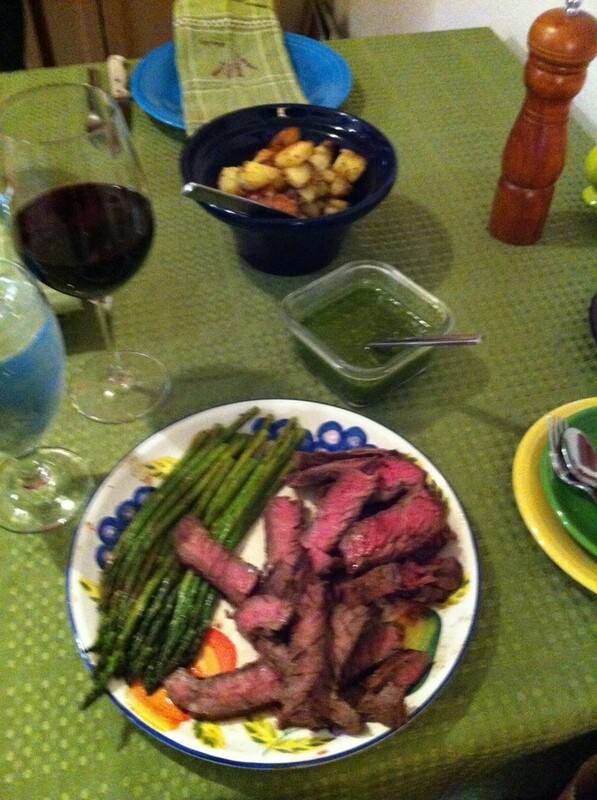 When you remove it from the grill, put the asparagus on the clean dish you intend on using for the steak. When the steak is done, but it on top of the asparagus and let them rest together. 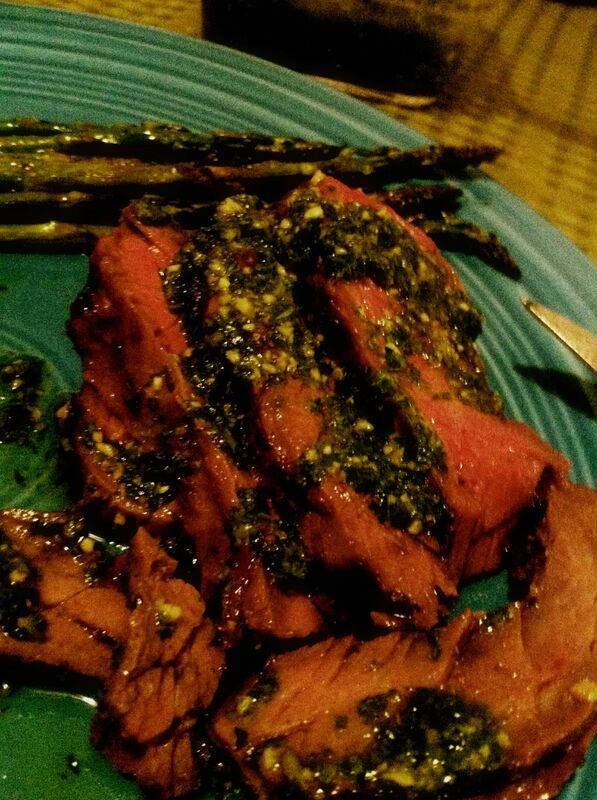 The steak and it’s seasoning and juices flavor the asparagus. I promise, it’s delicious. I used 3 red potatoes and had too much for two people. They weren’t huge, but too big. I should have done just two. Anyway, I cut them up, halved then halved again and then sliced by fours, then I boiled them until they were done. Yes, done. Then I shook the heck out of the pan, mashing some of them. Heat the oven to 400 degrees. Drain the potatoes, place in a bowl. Add some oil, salt, pepper and herbs de provence and then mix. Spread them out on a parchment paper covered cookie tray. Add a little more oil over the top, I mean a little, you won’t need much, just drizzle it over them. Bake them for at least 30 minutes, while you’re out grilling the meat and asparagus. They should be crispy on the outside and wonderfully fluffy on the inside. This stuff is like steak crack. Mmmmmm. In a food processor, place the following: one bunch of flat leaf parsley, strip the leaves and most of the stems, four cloves of garlic, salt, pepper, red pepper flakes, olive oil, juice of half a lemon and red wine vinegar. Blitz the heck out of it. For the amounts, you will need to taste it to figure out what you like. Start small, like a splash of vinegar and 1/4 cup of oil. You can adjust all of the amounts to what you like. 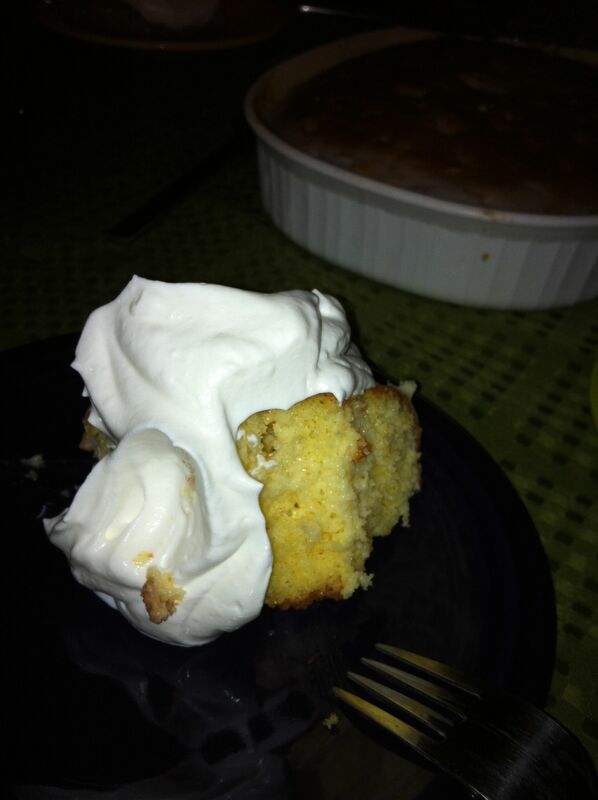 And then I make him a tres leches cake. YuM! I’ll post more specifically instructed recipes later, but none of these are the sorts of things that are all that specific. Everything depends on how you like it. We are going to try a mint chimichuri with lamb later this fall. I am certain I’ll be sharing that. It all looks delicious, and I’ll be doing my potatoes that way tonight! Oh! I can’t wait to hear how they turned out! We love them, they get crunchy on the outside and are really fluffy inside. Oh Rachel – the joys of chimichuri are vast and endless. Plus it’s really, really good for you. And it goes on steak. and potatoes. and vegetables. Everything. Chimichuri is a staple around here. We are happy to introduce you to the secrets of chimichuri. Thanks for the chimichuri recipe! I love that stuff, but have never made it myself.